8 September 2018 (Wall Street International)* – A wonderful thing about observing and analyzing the human mind is that there is a seemingly infinite variety of phenomena to observe and analyze. I sometimes wonder if it is even remotely possible to master this subject but, even if it is not, at least it provides an unending source of ‘entertainment’. 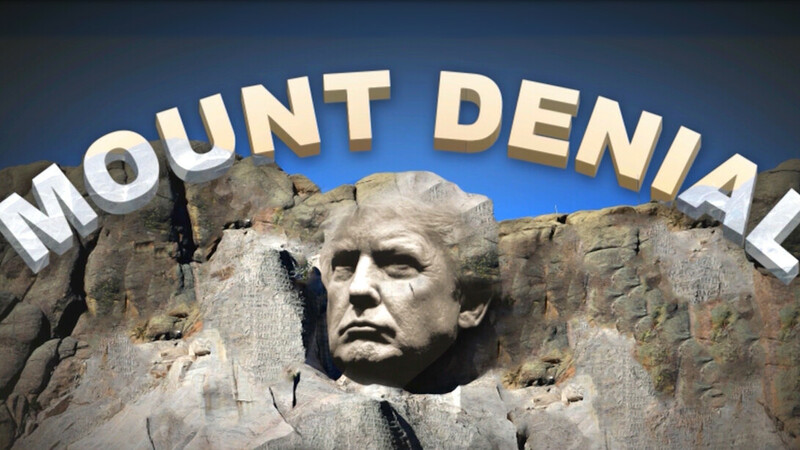 Mount Denial and Trump | Photo from Wall Street International. 3 September, 2018 (The Conversation)* – Between 1450 and 1750, some 45,000 men, women and children were executed in Western Europe as accused witches. Today, emerging new research shows that, during the past 20 years, upwards of 600 people were reported killed in witchcraft related attacks in Papua New Guinea, while current estimates are that thousands are killed in witchcraft-related violence around the world each year. 8 September 2018 (teleSUR)* – U.S. President Donald Trump has ordered that US$25 million earmarked for the care of Palestinians in East Jerusalem hospitals be directed elsewhere as part of a review of aid, a State Department official said on Saturday [8 September 2018]. 8 September 2018 – The UN Refugee Agency, UNHCR, has called on Libyan authorities to take action against criminals targeting desperate refugees and migrants, amid reports that smugglers and traffickers in the country are impersonating Agency staff. UNICEF/Alessio Romenzi | Migrants sit on mattresses laid on the floor at a detention centre, located on the outskirts of Tripoli, Libya, Wednesday 1 February 2017. A delegation of South Sudanese refugees tells the country’s leaders what they expect from revived peace talks in Sudan. KHARTOUM, Sudan, 5 September 2018 (UNHCR)* – Driven from his land by conflict in South Sudan, farmer Singira Mirihewari traveled for 18 hours to tell leaders negotiating peace in Sudan what millions of refugees like him need.